Brita Borg was one of the most popular singers and revue show- and theatre-performers in Sweden from the mid-1940s onwards. Brita Borg was born in Stockholm in 1926. She was the youngest of nine children, four of which were girls. Various accounts indicate that her parents Georg and Ellen were both musical and that this rubbed off on all the children. Both the guitar and the banjo were played in the home. Brita Borg harboured a desire to perform from an early age and already began to do so at school when she was only seven years old. When Brita Borg was 14 years old she entered an amateur competition held by Veckorevyn magazine in the Auditorium pleasure-dome. Although she did not place amongst the top ranks the short made of the event reveals that she clearly impressed the jury. Europafilm gave her a student’s contract and she got a part in the comedy film Kvinnan tar befälet which premiered in December 1942. She sang the song ‘När mitt hjärta bankar’ in the film, and this became her first recording in January 1943, accompanied by Sven Arefeldt’s band. Brita Borg entered the Veckorevyn competition again in 1943. This time she won first prize. This was certainly led to Sven Paddock and Nils Perne – both song- and text-writers – deciding to recruit her for the performing group called Vårat Gäng. This group comprised a number of youths from Söder in Stockholm and Brita Borg was a member from 1943 to 1945, and made her first radio programme with them. She also began to sing in dance bands, such as Lill Arne’s Sväng-Gäng, which was part of Vårat Gäng, and Carl-Henrik Norin’s band. Paddock and Perne also wrote revue shows for the Scala theatre in Stockholm. Brita Borg, by then already popular, made her debut on the stage at Scala in the autumn of 1947. She performed more than 200 times in the revue show called Vi på Wallingatan. At the same time she was also a vocalist in Allan Johansson’s newly established band which played at the La Visite dancehall. Brita Borg and Allan Johansson set up the singing quartet Flickery Flies in 1946, which remained active until 1964. Brita Borg married Allan Johansson in 1953 and their son called Allan was born in 1956. In 1947 Brita Borg began to work with Povel Ramel, partly on his radio programme Fyra kring en flygel, and partly in his group called F.F.F.F. (which stood for ‘Föreningen för flugighetens främjande’, or ‘association to promote craziness’), which was an expression of Povel’s crazy sense of humour. Flickery Flies also worked with them. Brita Borg recorded a large number of 78 rpms for the Sonora record label, both as a solo artist and with the group, between 1946 and 1957. Her best-known solo number is perhaps ‘Jag ska ta morfar med mej ut i kväll’ from 1949. The record entitled ‘Den gamla vaktparaden’, from 1951 and composed by Povel Ramel, is probably the group’s most played record. In 1952 Povel Ramel began his Knäpp Upp revue shows. Brita Borg was tied into them from the beginning, along with the Flickery Flies and Allan Johansson, and the latter served as band leader for the shows from 1952 to 1961. Knäpp Upp shows tended to be first performed at the Idéon theatre in Stockholm followed by a marquee tour. Brita Borg regularly performed with them for the first 10 years and then returned later for a few jubilee shows. Her position as prima donna remained secure. She often performed her own songs, but sometimes she was joined by Povel Ramel or Martin Ljung. Several of her songs, written by Povel Ramel, became major hits, including her performance for Knäpp Upp III in 1956 when she, blacked-up and padded out, acted and sang as ‘Fat Mammy Brown’, a chubby American jazz singer from Harlem, New York. In the Knäpp Upp musical Funny Boy, from 1958, Brita Borg portrayed the seductive gypsy girl Zamora and sang the tango ‘Banne mej’. That same year she also recorded ‘Frankenstein Rock’, which was an attempt to cash in on the rock sound, and the ballad ‘Trudie’. The latter apparently achieved a high position on the sales list maintained by the journal Show Business. Brita Borg’s biggest success is often given as the song ‘Die Borg’ from 1962 in which she parodied Swedish singers who had made their careers by singing in German, which was quite common at the time. The bosses at Knäpp Upp hired Hans Alfredson and Tage Danielsson on several occasions to work for them and thereby Brita Borg was supplied with the favourites ‘Alla kan ju inte älska alla här i världen’, from 1959 and ‘Du är min tekopp’, from 1960, and ‘Aldrig har jag sett en rak banana’, from 1961. These were all recorded on the Knäpp Upp label. Brita Borg’s fame as a singer increased sharply during the 1950s. Before the Melodifestival (annual music competition) in 1959 it was decided that she would perform the Swedish entry at the Eurovision Song Contest, regardless of who won in Stockholm. Siw Malmkvist won decisively in the domestic competition with her song ‘Augustin’, which it was believed stood a good chance of achieving a top position at the final in Cannes. Brita Borg was unsuccessful however and instead only managed a shared ninth position out of eleven competitors. One reason for the failure was that the song was performed much more slowly than it should have been, and this was due to the lack of a Swedish conductor for the band which meant that a ‘borrowed’ French band leader was relied on. During 1960 and 1961 Brita Borg made several acclaimed recordings with various duet partners. With Hans Alfredson she sang ‘Oj då kära nån’, which had originally been performed by Peter Sellers and Sofia Loren, and the similarly humorous ‘Märta Melin och Ture Tyrén’, about a couple ‘far away in the forest in the land of the Northern Lights’. Yet another duet from that year was ‘Jasså’, from Knäpp Upp’s marquee revue show, which paired Brita Borg with Martin Ljung. The characters of Olga and Ture both speak and sing about themselves in this comic number as two shy but lovesick individuals. In 1961 Brita Borg was honoured to make two recordings with an elderly Evert Taube. They sang ‘Invitation till Guatemala’, in which the romantic text concerns Mr Leornadin and Miss Larzon, as well as ‘Mary Strand’, the woman in the Tiger Brand cigar shop who rescues her beloved seaman from an English policeman. Brita Borg made the Svensktoppen on five separate occasions. The first four songs, two in 1963 and two in 1965, only charted briefly. In contrast, the last one, ‘Ljuva sextital’, was voted in in June 1969. The tune was written by Benny Andersson, Stikkan Anderson, and Björn Ulvaeus. The text begins in 1990s and looks back to the 1960s when ‘the majority knew who their father was’ and ‘one travelled to the moon in giant steel tubes’. This song remained in the charts for 20 weeks and reached its best placement at number 2. Povel Ramel was not the only revue show producer who hired Brita Borg. 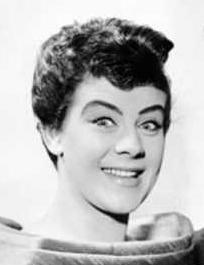 In 1958 she had already appeared in Karl Gerhard’s new year revue show, in which she sang ‘Utsikt från en bro’ describing the longing of a seaman’s wife – it is considered to be Brita Borg’s best recording. In 1965 Brita Borg made her debut in Blågula Svea and she was hired by Hagge Geigert for several of his revue shows I Uddevalla, but mainly for the Liseberg theatre in Gothenburg. At some point around 1970 Brita Borg was also involved in the annual performance of the Kar De Mumma revue at the Folk theatre in Stockholm. During the later half of the 1960s Brita Borg began to transition across to operettas and dramatic theatre, for which she often received acclaim. From 1967 onwards she often appeared in the various productions at the Riks theatre. Of her various performances her Call Me Madam appearance in 1967, Annie get your gun in 1968 and 1973, Chicago in 1977, Spelman på taket in 1979, Oh Mein Papa alongside 12 prima donnas in 1988, and even later Tolvskillingsoperan merit special mention. She performed her first purely speaking role for the Riks theatre in 1978 in the play Sjöhästen, and she acted opposite Tor Isedal. Yet another play in which she acted a central part was the tv-edition of Polskan och Puckelryggen, from 1983, with Halvar Björk as her male counterpart. That same year she acted in the tv-play Pariserliv, a historical drama from 1871. The last part Brita Borg played for the Riks theatre was Jubilarerna in 2001 in which she played opposite Kent Malte Malmström. She was forced to leave the show due to illness. However, the following year she appeared in the tv-programme Så ska det låta in which she competed with Jonas Gardell. It is not known how many individual records Brita Borg recorded during her lengthy career. The same is true of the number of radio programmes she participated in. It is certain that the numbers in both cases would be several hundreds. During her long career Brita Borg acted in 15 films, although none of these led to major critical acclaim and her contributions can all be described as supporting roles. She was also in a tv-series called Dagar med Knubbe from 1978 in which the main character was a seven-year-old boy, as well as another from 1984 called Julstrul med Staffan och Bengt, which served as SVT’s Christmas calendar that year. Brita Borg took a break from touring around Sweden for a time during 1975. She then worked as a military performer for the UN soldiers in the Middle East. In 1978 she married for the second time, to a policeman called Stig Salomonsson. She lived with him for over ten years in Arvidsjaur. The couple moved from Västra Frölunda to Löttorp on Öland in 2005. In the mid-1990s Brita Borg developed lung cancer and was forced to have half of one of her lungs removed, followed later by the removal of the remaining half. However, she retained her special voice. She then underwent double knee operations, one of which was not successful, which left her dependent on a walking frame from about the year 2000 onwards. She remained determined to perform albeit from a seated position. When she realised that job opportunities on Öland were decreasing she complained that ‘They want you to be young and to stand and wiggle and shout on the stage. My repertoire is Povel Ramel and his contemporaries’. Brita Borg died in May 2010. Brita Kerstin Gunvor Borg, www.skbl.se/sv/artikel/BritaKerstinGunvorBorg, Svenskt kvinnobiografiskt lexikon (article by Lennart K Persson), retrieved 2019-04-22.